More colorful emails, emoticons and distractions of any kind in a more in a light interface, all these with IncrediMail. IncrediMail is an email client that offers the possibility to customize e-mails as desired. The application offers a wide selection of rear-end, animations, sounds and 3D effects. IncrediMail offers all management options for conventional messages and manage multiple identities and import address book and messages. In the words of its editor, the email client Incredimail makes the user more productive still providing more entertainment. Big colored buttons appear and the, a search bar allows to quickly find emails and attachments images, videos and other documents. 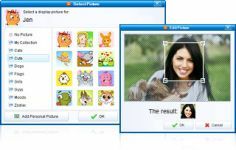 Contact Manager provides the ability to organize favorite correspondents and assign an avatar of users choice: cats, dogs , flags, girls, boys, astrological sign. There are the animated "notifiers " flapping each receiving mail, hundreds of emoticons, templates for letters, colored backgrounds, e-cards, 3D effects, but also traditional sound emoticons like "Kisses and Wassup". It is also possible to create a signature freehand, record audio messages or use the integrated babylon translator.